Elizebeth Friedman (nee Smith) was a librarian before being hired at an early "think tank" called Riverbank Laboratories in 1916. At Riverbank, she was assigned to a project that sought to find hidden patterns in William Shakespeare's work, which would purportedly show that Francis Bacon had actually authored some or all of the Bard's work. Her research disproved rather than proved this notion, but while working on the project she met and married William Friedman, and they remained at the forefront of cryptography for the rest of their lives. While still working for Riverbank, she and her husband helped crack codes used by US-based spies during World War I. She worked as a cryptanalyst for the US Navy followed in 1923, and later worked as a cryptographer with the Prohibition and Customs Bureaus and the US Coast Guard, helping to capture an array of rum smugglers, bootleggers, and international spies. Her work, alongside her husband and on her own, helped bring advanced mathematical and scientific processes into cryptology, and she and her husband wrote The Shakespearean Ciphers Examined, considered the definitive debunking of the Shakespeare-Bacon controversy. 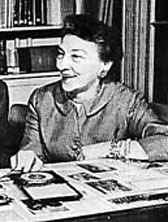 For amusement, Friedman and her husband occasionally hosted elaborately staged treasure hunts for friends and colleagues, with coded clues sending participants to numerous locations across the greater Washington DC metropolis. She died in 1980, eleven years after her husband, and the simple but appropriate phrase "Knowledge is power" is engraved on their shared tombstone at Arlington National Cemetery.